Wilber V is definitely an improvement on earlier stages. In Wilber III-IV there always lurked in the background of his theory some slight uneasiness. For it remained somehow a puzzle how psychological development stages (structures) are to be matched with (higher) states of consciousness. 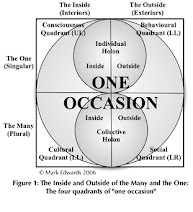 The relative simple answer to this question at the time was: higher states of consciousness, like the ones exhibited by the mystics of world culture, are merely higher stages/structures of psychological development. You first have to go through all of the lower stages of development before the ripeness settles in to realize some of the higher spiritual states. 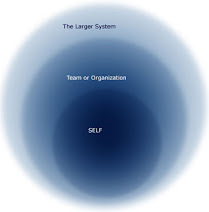 Second tier development can only begin after consolidation of first tier growth. And so it is with third tier development: it can only come after first and second tier development and not before or in between. 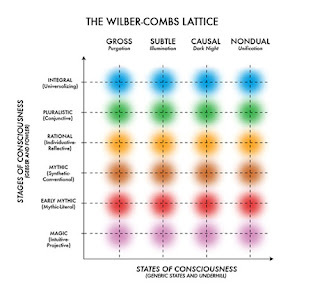 This solution to the problem of how states and structures were to be related ('stack the first on top of the latter' as Wilber himself now describes this earlier theory rather derogatively, making higher states of consciousness somehow equivalent to higher stages) was in itself the outcome of a deep crisis in Wilber's philosophy. For Wilber I-II still adhered to Jungian and neo-Romantic notions of spirituality being a return to the glory and innocence of childhood. Enlightenment in this phase was seen as a kind of home coming to 'the trailing clouds of glory' (Wordsworth) of our golden childhood. Children were seen as still possessing spiritual treasures we adults somehow seem to have lost. In this earlier view spirituality is to be defined as the art of finding those lost treasures again. This was Wilber at the beginning of his career. But this made Wilber himself (and others) rather uncomfortable at the time. For the data of zone #2 research about psychological development did not match this theory. Researchers like Piaget, Baldwin, Loevinger and others had busted the myth of childhood spirituality being a higher kind of realization. The 'trailing clouds of glory' were proven to be rather chaotic meteorological phenomena, with archaic dark thunderstorms and sudden magical lightings, instead of enlightened celestial glory all of the time. Childhood was proven to be more of a tentative beginning within a gradual spiritual process than the acme of it.